The title in one of the sidebar boxes isn't right. I hadn't noticed this before, so it may be new, although I don't think we've had any tweaks recently. Or perhaps it's just me and my browser (Chrome 67.0.3396.99 (64-bit) on Windows), or it may be a moderator thing if the Edit link is restricted. "Edit | Add a favorite tag"
But the CSS spacing appears to have been applied to the bottom of the "Watched tags" box rather than the top. So it's still a bug, just a different one. And I really dislike the crude image of binoculars which doesn't match anything else in the theme. 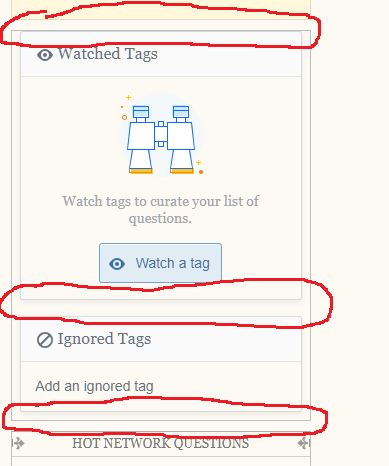 At least "Watched tags" means that the spelling of "Favourite" is no longer an issue!